Halifax stayed on course for a top four Championship finish after a hard-fought home 25-22 win over Batley Bulldogs. Richard Marshall’s side, who have now won seven games straight, looked to have the contest sewn up when they led 24-6 inside the final quarter. But a Wayne Reittie interception, converted by Scott Leatherbarrow, cut the gap to 24-12 before prop Keegan Hirst added the visitors’ third try to make it 24-18. 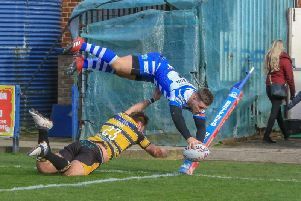 Halifax captain Scott Murrell tagged on a drop goal to give his side a seven-point lead, before Reittie’s second left the home side hanging on for the final minute. The opening quarter had been a nip and tuck affair, with Batley hanging on early on - with James Saltonstall and Mitch Cahalane both breaking the line - before turning the contest into the kind of arm wrestle usually associated with mid-February. Halifax did their bit with a rash of uncharacteristic handling errors, and it took them until the 33rd minute to finally break the deadlock. The try, when it came, was hardly carefully constructed; young half back Ben Johnston wriggling clear of a couple of grasping defenders and darting over behind the posts. Steve Tyrer kicked the conversion and, with pressure building on the visitors, Halifax doubled their lead close to half time. Tyrer rose high to claim a Scott Murrell cross kick, tapped the ball back inside and, eventually, it found its way to Adam Robinson, who dived over under the posts. Tyrer made it 12-0 at the break, before Batley’s James Day touched down five minutes into the second half, Leathebarrow converting. Halifax took charge of proceedings when James Saltonstall touched down, quickly followed by Johnston, Tyrer converting both for a 24-6 lead. But Reittie’s try sparked an unexpected grandstand finish.